Travel safety tips with dogs. Whether you are traveling with your dog for vacation or just a weekend getaway, safety is always important. This is particularly true if you are traveling alone. You can read my post Solo Driving With A Dog-Safety Tips for more ideas on how to stay safe. But today, I’m going to talk about keeping yourself and your dog safe during your dog-friendly hotel stay. 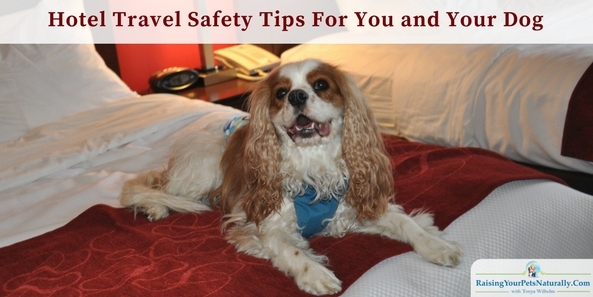 Here are 11 hotel safety tips to get you started on a safe and fun vacation with your dog. 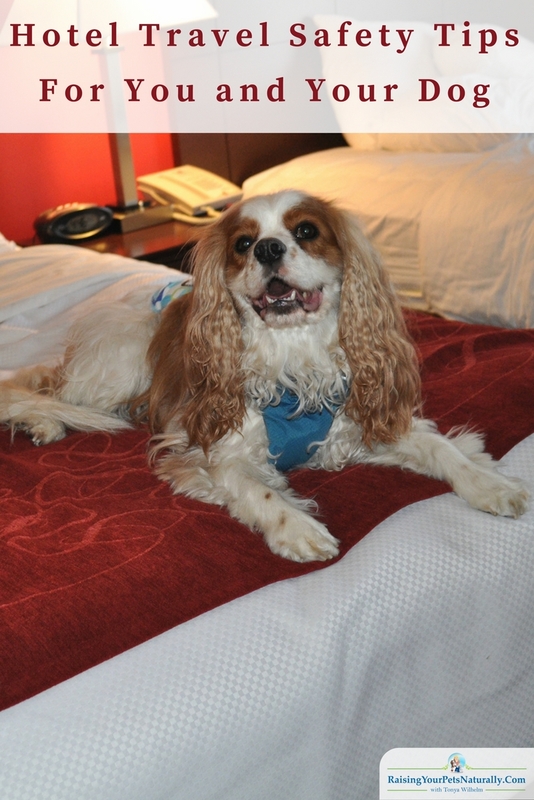 Research Dog-Friendly Hotels: Before you even get to #2 on the list, do your research. Check out the location of the hotel, their reviews, and even a crime check of the area. Finding a hotel that is dog-friendly can also mean the hotel is less than secure. You can visit Google maps and get a pretty good idea of the area by viewing up and down the road with the Street View option. Book Your Reservation: Booking your dog-friendly accommodations ahead of time can save you a lot of grief and time checking in. You also don’t want to think you have an ideal hotel only to find out they are booked full, and you end up driving all over a new town trying to find a dog-friendly hotel. Request a room not on the ground floor (See #4). Park Close When Checking In: Park as close to the check-in, ideally under the covered port if it’s open. Unfortunately, some criminals target vacationers and nothing says vacationer like someone checking into a hotel. Checking In: When you check in, ask the front clerk not to announce your room number, to write it down and make sure your room is not on the ground floor. Being on the ground floor is easier for criminals to break into and could have unsavory people loitering around. However, being higher than floor 6 is too high for firetruck ladders. Your dog is also a consideration during this part. Assuming the weather is reasonable and I am able to park close, I leave Dexter inside his locked dog crate inside the locked car while checking in. Visual Inspection: Before moving your gear into your hotel room, check your room (without your dog). Check to ensure it is clean and up to your standards. This is also the time to make sure that nothing is left for your dog to eat like pills, candy, food wrappers, or who knows what. Check under the bed, in the corners – do a thorough visual sweep. Look at the windows and door to make sure they are secure and locked, including any adjoining rooms. Look at the evacuation card on the door, so that you know where the stairs are in case of an emergency. Check the telephone to make sure it works properly. Moving In: Once again, park as close to the elevator as you can, to make moving into your hotel room as quick and easy as possible. If the hotel provides luggage carts, this will make your move easier and hopefully with fewer trips. 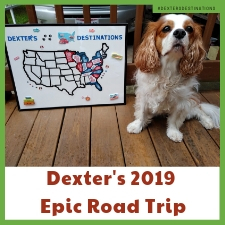 This is another time I keep Dexter in the car, I don’t want to have to worry about him getting in the way, trying to manage the cart, my luggage, and Dexter going up and down the elevator. Try to take the elevator alone. If not, avoid pushing your floor number until the other guests have pushed theirs. Be aware of yourself and the others in the elevator. Stay close to the elevator buttons with your back against the wall. By staying close to the elevator buttons, you will be able to hit the emergency button if needed. Bringing In Your Dog: Before you walk your dog up to your hotel room, take him for a good potty break, preferably in a well-lit location. Look for a location that is very visible to the front desk area, with people coming and going. This is not a time to be unseen. 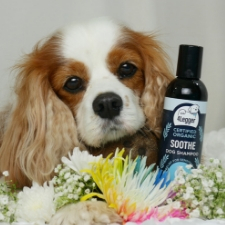 As always, pick up after your dog and do not allow him to water the ornamental flowers or outdoor furniture. During Your Stay: While you are in your hotel, keep the door locked, dead-bolted, and chained with the Do Not Disturb sign up. If your hotel does not have a deadbolt, consider bringing a portable door lock. You can also increase your safety by bringing a portable hotel room motion detector or portable door alarm. Close your curtains so people cannot view inside your room. Keep your room key and your car keys next to your nightstand for easy access. Never open the door to anyone you were not expecting. If they claim to be the hotel staff, security or a police officer, call the front desk to verify. Potty Breaks: Just like in #7, make sure to stay in an area that is visible and well-lit when you are walking your dog. Try to get your dog to do his last call before it gets too late at night and dark. Leaving Your Room: If you intend to leave your room while you stay, make sure any valuables are stored safely in the hotel safe, a portable safe or not left behind. Turn on the television, lights and place the Do Not Disturb sign on your door prior to leaving. Room Cleaning: I personally do not have the hotel staff clean my room during my stay. I will, however, get fresh towels every morning from the front desk. I’ve talked with people who are afraid to travel because they have heard so many traveling nightmares. Please don’t let these stories stop you from taking a vacation with your dog. Bad things can happen anywhere at any time. Just be smart and safe and have a great time! Do you have any hotel safety tips to share? Let me know in the comments below. 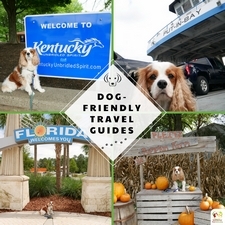 Thank you for sharing some great tips for traveling with pets and hotel stays. We haven’t had to do it often, but it’s good info to know! I’m a fairly confident traveler in all kinds of settings (living next to a crack house for over a decade teaches you not to stress the small stuff). But I hate hearing about people who don’t travel because they’re afraid. You’ve given some great tips, especially for solo travelers, that should boost the confidence of anyone looking to go somewhere new with their dog. Thanks, Pamela. I too am sad that people are afraid to travel. It was a FB friend that asked the question that inspired this post. There is a lot of stuff to remember when taking a dog for a trip! Some is good care and common sense though and as long as you plan ahead you are OK! Great information here! Traveling can be stressful and sometimes scary, especially if you’re traveling alone. You give great advice here to help make the travel experience safer! Your advice for hotels also works for those who don’t travel with pets. I was a little nervous at the hotel where I stayed at GPE recently because my room was on the back of the property with an outside entrance. Had I known this, I would never have stayed there. Thanks. Scary! I’m glad everything was ok. I would add – if you are in a high risk area for natural disasters know the escape routes AND what the pet policies are for shelters etc. These are great easy to follow tips for pet parents traveling with their fur kids. My cat passed away however I did follow some of these very same tips. Doing research, inspecting the room and keeping them close when checking in works well. I think also showing a “mini tour” of the room helps get them adjusted too. Cute pic too! Fantastic tips. I have not yet had to stay at a hotel with my any of my Huskies yet, however, we are planning a future trip to the Mid-West for a possible relocation, and this may just come in handy! Thank you. I just Pinned it over on my “Bark About” board. Thanks! Good luck on the adventure. Great tips! I didn’t even think about checking the room for things left like pills on the floor! That could be deadly to a dog! The things I’ve found under beds, even in fancy hotels. Pretty scary. Those are great tips! We haven’t traveled much with the dogs we have now, but I would like to start taking them places. When planned, it is so much fun! As a dog mom who has traveled with dogs for 25 years or so, I used to also be a heavy dog travel writer. 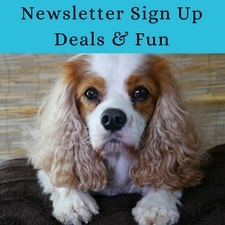 Lots of great tips here and I dont travel without a dog (only when I fly am I solo). We love traveling with the three dogs – the only caveat is the doxies are super sound sensitive so they bark at every noise and we end up renting houses or cabins that are stand alone structures and play loud white noise makers to drown out sounds. Traveling with our dog Sherm is easiest but I hate leaving the others behind! Great tips! I really enjoy renting homes too. We tend to stay in hotels on the way to destinations. Asking for an end unit, not the ground floor, can help with noise. I actually feel safer when traveling with the pup because he’s a good watch dog barker. He’s pretty reliable in that way unlike some dogs who bark at everything! I try to take him out in well-lit areas. We travel with our pups pretty regularly and your tips are great! We always bring water – oddly enough, hotel water tastes different, and is different from region to region…. sometimes our dogs are weirded out by this. 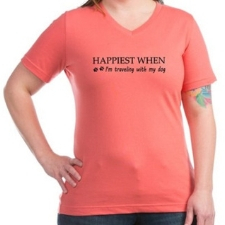 So, we pack it with us to keep things all happy and thirst free! Point #4 is interesting. Many hotels have all their dog friendly rooms on the ground floor. We like the convenience of it too, but you’re right about that being more susceptible to no-goodnicks! I’ve never heard of a portable safe, that is very interesting, and so are all the portable devices you mention. It looks like your links all point to an Amazon page w/ carriers & pens though. I’ll have to search on those later. Thanks for sharing this excellent advice, I’m pinning it to my Pet Travel board! Such an amazing post. I always tell folks, when you pack your bags, pack your common sense. I travel a lot for work and I agree wholeheartedly to all of your points. I also recommend checking the bed bug registry when planning travel in advance and checking for bed bugs before bringing anything in the room that has fabric. I pack all of my clothing in plastic bags (ziplock) by day so that they are protected. I also pack a sleeping bag in the event that I don’t feel comfortable using the bedding at the hotel. I use a door stopper with an alarm, much like what you posted. You can never be too safe or aware of your surroundings, particularly when traveling alone.